Junior, Senior and Big League Diamond, with lights. Curfew at 11:00 pm for night games. Directions: Turn north off of Lougheed Hwy onto Blue Mountain Rd. Climb up the hill past Austin Avenue, Blue Mountain park is about two blocks on your right. This is the senior and Big League Diamond for Langley Little League. The diamond is located at City Park in Langley. The diamond was dedicated in the memory of Brent Barbour, a long time Langley coach. White Rock South Surrey Major size diamond. Located on the corner of 147th St. and 16th Avenue. Travelling west on 96th Avenue, turn left onto 124th Street, then right on 94A Avenue. Drive one block, the road ends at the parking lot. Mackin Park is the Major division diamond for Coquitlam Little League. It is located on Brunette Avenue at Nelson Street. 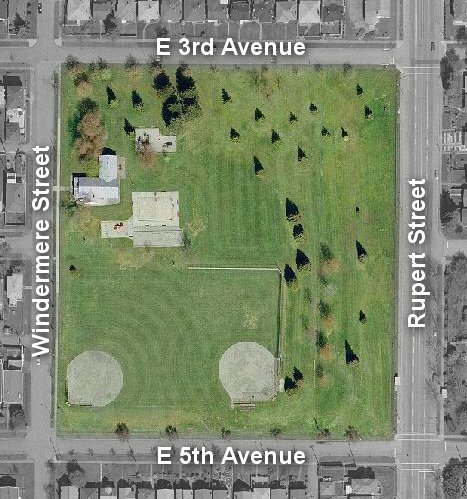 Township of Langley Park used by Langley Little League's older divisions of play. Take the exit- exit number 22- toward MT SEYMOUR PARKWAY at the North End of the Iron Workers Memorial Bridge (Second Narrows). across 20th Avenue from Softball City, at 148th Street. In behind the Walnut Grove Community Centre and High School, on Walnut Grove Drive. One Block north of 88th Avenue. 10665 134th Street. Two blocks west of King George Hwy, 1.5 blocks south of 108th Avenue. The park is located in District 5 North Vancouver. Proceed to 19th and Lonsdale. Go west on 19th. When you get to the end of 19th, turn right on Jones, then take the first left into the gravel parking lot. The Little League field is at the far end of the parking lot. Located in the 2100 block of Kirkstone Rd., west off of Mountain Hwy. Click on the caption to go to a map.